Sometimes when I’m feeling low I like to imagine DeMille still alive today and watching Mumblecore. I mean, think about it! What would he say if he saw Greta Gerwig’s lifelike pauses in dialogue or Cris Lankenau and Erin Fisher LITERALLY eating coleslaw onscreen in “Quiet City”?! I don’t mean to insult DeMille or Mumblecore but merely to illustrate that DeMille was, above all, a showman. His background was in the theater, much like Stanley Motts in “Wag the Dog” who explained that he was often accused of being “too theatrical.” Ah, but what is the circus but TOO theatrical? A circus can’t be KIND OF theatrical or a LITTLE theatrical. It’s a circus! It was but a matter of time before Cecil made a movie under The Big Top. It opens with a towering voiceover that may as well have been ripped right from the pages of Genesis. “The circus is a massive machine whose very life depends on discipline and motion and speed. A mechanized army on wheels, that rolls over any obstacle in its path, that meets calamity again and again, but always comes up smiling.” It’s an effective tone-setter for what is to come, with The Great Orator himself, Charlton Heston, as Brad Braden, General Manager of The Greatest Show On Earth. The Board of Directors plans to reduce the number of shows per day and to only play big cities as a means to cut costs. Braden cuts them off at the pass by signing The Great Sebastian (Cornel Wilde), the world’s greatest and most daring trapeze artist. This will bring in more people and drive up profits. Alas, it also means Braden must tell his girlfriend Holly (Betty Hutton), the show’s current #1 trapeze flyer, that she will be downgraded from Center Ring to Ring 1. The Great Sebastian, after all, is the center of attention. Holly accepts but also explains she will do everything in her power to reclaim her rightful spot in the spotlight. This is the main story but far from the only one. Gangsters have their dirty, filthy hands in the Midway concessions and games. Buttons the Clown (Jimmy Stewart), never without his makeup, is hiding a perilous secret. And don’t think that train roaring down the track carrying the circus from place to place won’t eventually wind up……but I won’t spoil it. There are two love triangles – Braden & Holly & Sebastian and Holly & Sebastian & Angel (Gloria Grahame). There is a musical number. And yes, there is, of course, the circus. That is to say the circus is not merely the backdrop – staging scenes at the show rages all around – but the point. 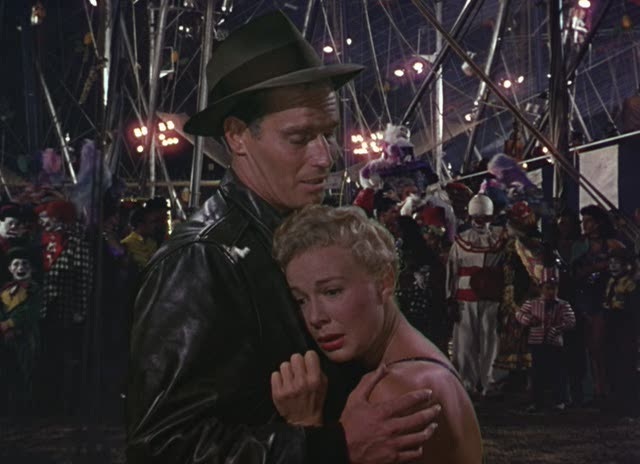 Again and again, “The Greatest Show On Earth” stops with all the character melodrama just to revel in the show itself. Generally DeMille’s film is regarded as one of the worst Best Picture winners of all time. It defeated the highly favored and very well regarded “High Noon”, a film partially famous for choosing to convey its story in “real time”. This lent it a distinct air of realism. 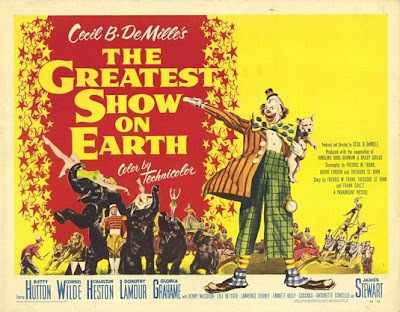 And the expected argument might go that “The Greatest Show On Earth” lacks a distinct air of realism, choosing instead to be “too theatrical.” But let’s look at it another way. When you were a kid and went to the circus, what happened? I can say that my senses were pulled in any number of directions – after all, there is a lot going on. You concentrate on center ring and then you lose interest and concentrate on a different ring and then you lose interest and ask (whine for) your Dad to take you to the concession stand to get popcorn and a program and nachos and then you return to your seat and lose interest in the popcorn and the program and the nachos because there are real life tigers in the center ring and so on and so forth. “The Greatest Show On Earth” is broad and all over the place, yes, but you smile, you laugh, you gasp, and you shake your head at the absurdity. It's life under the big top.